Abstract. The volcanic region of Mt. Etna (Sicily, Italy) represents a perfect lab for testing innovative approaches to seismic hazard assessment. This is largely due to the long record of historical and recent observations of seismic and tectonic phenomena, the high quality of various geophysical monitoring and particularly the rapid geodynamics clearly demonstrate some seismotectonic processes. We present here the model components and the procedures adopted for defining seismic sources to be used in a new generation of probabilistic seismic hazard assessment (PSHA), the first results and maps of which are presented in a companion paper, Peruzza et al. (2017). The sources include, with increasing complexity, seismic zones, individual faults and gridded point sources that are obtained by integrating geological field data with long and short earthquake datasets (the historical macroseismic catalogue, which covers about 3 centuries, and a high-quality instrumental location database for the last decades). The analysis of the frequency–magnitude distribution identifies two main fault systems within the volcanic complex featuring different seismic rates that are controlled essentially by volcano-tectonic processes. 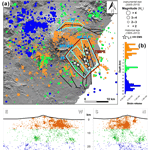 We discuss the variability of the mean occurrence times of major earthquakes along the main Etnean faults by using an historical approach and a purely geologic method. We derive a magnitude–size scaling relationship specifically for this volcanic area, which has been implemented into a recently developed software tool – FiSH (Pace et al., 2016) – that we use to calculate the characteristic magnitudes and the related mean recurrence times expected for each fault. Results suggest that for the Mt. 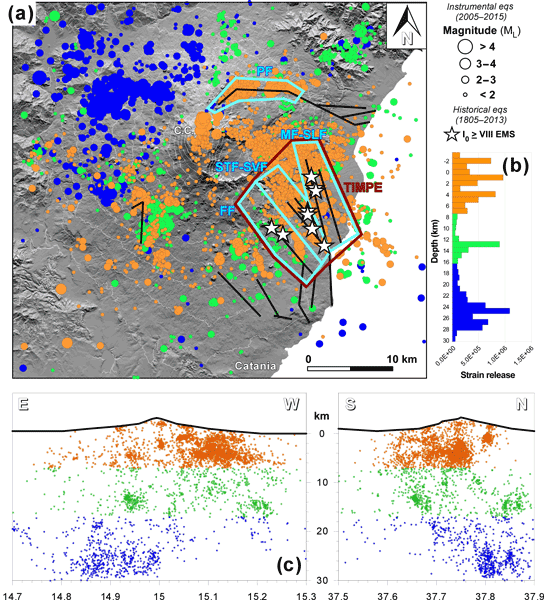 Etna area, the traditional assumptions of uniform and Poissonian seismicity can be relaxed; a time-dependent fault-based modeling, joined with a 3-D imaging of volcano-tectonic sources depicted by the recent instrumental seismicity, can therefore be implemented in PSHA maps. They can be relevant for the retrofitting of the existing building stock and for driving risk reduction interventions. These analyses do not account for regional M > 6 seismogenic sources which dominate the hazard over long return times (≥500 years). How to cite: Azzaro, R., Barberi, G., D'Amico, S., Pace, B., Peruzza, L., and Tuvè, T.: When probabilistic seismic hazard climbs volcanoes: the Mt. Etna case, Italy – Part 1: Model components for sources parameterization, Nat. Hazards Earth Syst. Sci., 17, 1981-1998, https://doi.org/10.5194/nhess-17-1981-2017, 2017.